North Texas Giving Day. This is the third year we’ve participated and it has become one of the largest sources of funding for Love Thy Neighbor. In 2017, we received over $15,000 from generous donors, plus a $5,000 match from an anonymous donor, putting us over $20,000, and hope to top that in 2018. This was our best year ever, surpassing $21,000 in total pledged donations for 2018. We thank all of our generous donors. In 2017, our donors gave $21,162 total donations, and in 2016 the donations totaled $10,979. We are humbled to be the recipient of such generous people. 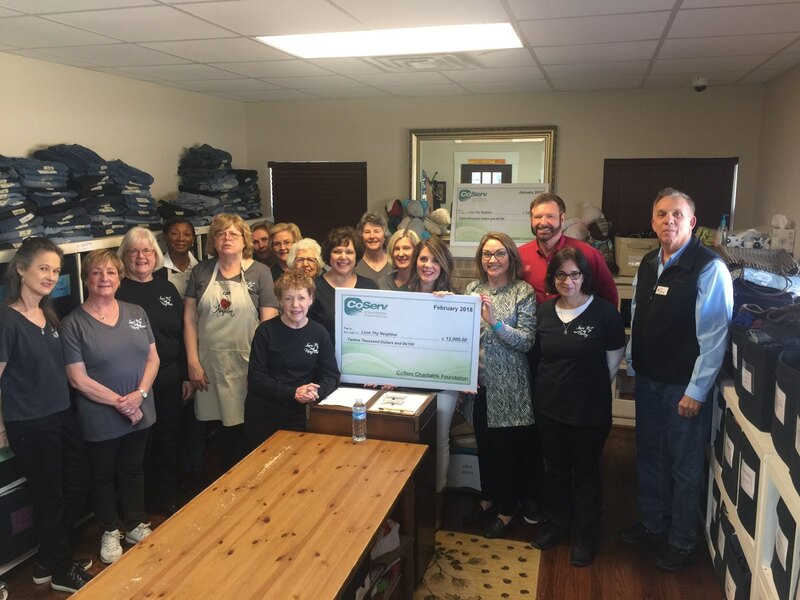 On February 1st, 2018, the CoServ Charitable Foundation presented Love Thy Neighbor with a check for $12,000 for the Clothing Assistance Program. This grant is to purchase new shoes, socks and undergarments for the Clothing Assistance Program that we run at The Salvation Army. It is necessary to purchase new shoes, socks and undergarments for our CAP clients since we either don’t get enough donations or donations would not be appropriate (undergarments). This grant, which is the third of its kind, will greatly assist the CAP program’s ability to supply the needs of its clients. A big THANK YOU to CoServ! MARK YOUR CALENDARS for 9/14/2017 NORTH TEXAS GIVING DAY! This one-day online donation forum is for approved non-profits throughout North Texas. 2017 marks LOVE THY NEIGHBOR’s 3rd year of participating…each year has been better and better with the support of you, our donors, sponsors and volunteers. The online website for donations will be available beginning at 6am…..for you early birds!! More details to follow as the date grows closer!! Stay tuned. THANKS for the last 2 years….lets make year 3 our BEST!! Put your Dancing Shoes on and join Dance Works Studio in Southlake this Friday, Sept 8 for a “DANCE YOUR SOCKS OFF” PARTY!! You are invited to take a 1 hour FOX TROT dance lesson from 7-8pm, then dance and party from 8-10:30pm. All of this for a minimum $15 donation. Drinks and light snacks provided. A bin is set up to collect new undergarments and socks supporting LTN’s Clothing Assistance Program (CAP). All sizes needed: men, women, girls, boys and kids. Can’t make it? Drop your undergarments of at Dance Works Studio from 1-9pm Mon-Thurs and 1-10:30pm Friday. You can also make a donation on our new website:www.ltnlovethyneighbor.org and annotate DANCE. Dance Works Studio: 2008 E St Hwy 114, Southlake, TX 76092. LET’S DANCE TOGETHER! Please see the benefactor page on the left side menu for the Hall of Fame and All Star Team. This page will be updated periodically as donations are made. The Hall of Fame is permanent. It displays donors of $1,000 or more. The All Star portion is for donations under $1,000 and is good for the calendar year.